Eureka! Entertainment have announced the home video release of Roma, one of the most famous international hits by Federico Fellini, the most popular Italian director of all time (in case you're new to film, his works include La strada, 8-1/2, Satyricon, City of Women and much more). 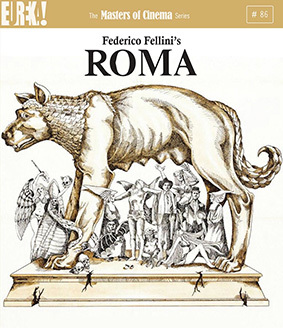 Roma is a landmark film in the history of '70s art-film, and one of Fellini's best known-films to this day. Roma [Rome] erupts volcanically as a state-of-the-world pronouncement on what was not only happening within Rome at the tide of the hippies' organic birth and the post-Boom-set that made up his characters of the 1960s films, but also where, and how, his city would move feverishly forward into one of potential futures. As Fellini himself travels with his crew to document the ring-road circling Rome, with all the natural diversions that might inherently divert a traditional film shoot, we move into episodes that chart the wartime difficulties of Roman life across those fleeting times that chronicle love and life within the modern-day Rome-time, themselves pitted against the archaelogical vestiges of the great city, and the Catholic church rears its dominance, and we come into a midpoint that positions itself, indeed, between the memory-cinema of Satyricon and Amarcord. One of the great and bountiful colour-spectacles of Fellini's cinema, almost leapt off toward from the moment of Giulietta of the Spirits, Fellini's Roma remains a passionate testament both to the city that finally claimed him as its son after he left small Rimini, and to the final stage of cinema that he himself would work till the day he died. Roma will be released for the first time on UK Blu-ray on 17th february 2014 by Eureka! as part of the Masters of Cinema series at the RRP of just £15.99.